I was so excited when I was sent this book last month to review, as I knew it would be a great addition to our book advent this Christmas. As you can see from the book cover, this advent story has 25 flaps for advent, that your kids will have fun opening as they count down to Santa's arrival. Filled with colorful, festive illustrations, you can't help but get into the holiday spirit as you sit down to read this cute book with your children. This book is meant to be read in one sitting, and for children to have fun opening each numbered door to reveal a picture along with it's word, to help kids recognize words as you read to them. My girls loved this book, and had so much fun trying to guess what was behind each of the 25 flaps/doors. Within the first week of receiving, we read it almost every night. The girls agreed that they wanted me to wrap this book and add to our book advent countdown, and I agreed. It is now wrapped, and ready for the girls to unwrap as we welcome in December shortly, and begin our book and movie advents, counting down to Christmas Day. "Snow is falling on Christmas Eve, the stars are out, and everyone is in bed--will Santa visit in the night? 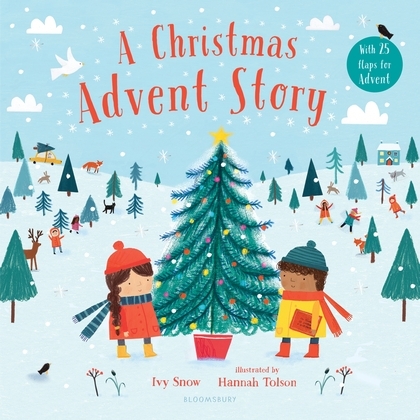 Follow the story of a little girl, boy and their dog in this advent countdown. Along the way you'll find 25 flaps, each introducing a new word in this magical holiday book. Sing carols on a busy street, watch ice skaters spin and twirl, bake cookies, look out for reindeer, and pick a tree, all in preparation of the perfect Christmas Day."